Cynthia Barnett is an award-winning environmental journalist and Hearst Visiting Professional for 2015 at UF's CoJC. She is the author of the water books Rain: A Natural and Cultural History; Blue Revolution: Unmaking America's Water Crisis; and Mirage: Florida and the Vanishing Water of the Eastern U.S. This spring, students in Environmental Journalism class devoted the semester to Project Blue Ether, a series of water stories that reveals our connection to the aquifer — and our collective role in solutions to over-pumping and pollution. The series ran for 14 weeks on WUFT News. Read it here, for a powerful impression of how our taps connect to groundwater and the springs that define the good life here in North Central Florida. Photo by Jennifer Adler. UF graduate students Meghan Mangrum, left, and Hannah O. 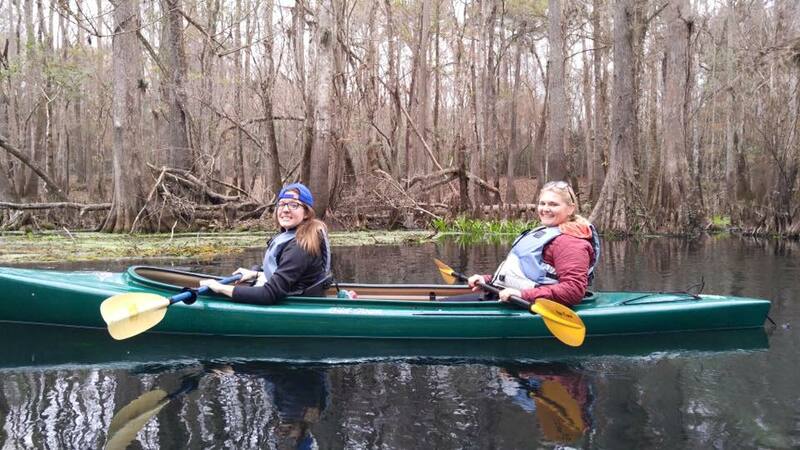 Brown paddle North Florida’s Ichetucknee River on a field trip for Environmental Journalism class. Water – it gives life and it takes it. Rushing rivers, riptides and hurricane rains seem like such a different beast than the 24 ounces of tap water in my blue Contigo water bottle. Despite a childhood in Central Florida, consisting of summers spent splashing in Grandma’s backyard pool, I have maintained a fear of water for most of my life. “I should have taken a Xanax,” I joked, but not really, before we launched on our journey down the Ichetucknee River. A non-mandatory field trip for my Environmental Journalism class at the University of Florida, I decided this was just the way to tackle my fear. At least I trusted that our instructor did not want to make the news for a grad student drowning on a peaceful class outing. Our guide (and the life vest that I zipped and buckled tightly around myself) helped quiet my fears enough to grab a paddle and prepare to climb into the tandem kayak I would share with a classmate. Yet, stepping into the kayak, inches above the dark water and drifting away from the dock, brought my anxiety levels as high as the cypress trees that reached above us. My first mate, Hannah, had the perfect amount of patience and a calming voice that assured me I wouldn’t drown. We agreed early on that the goal was to stay out of the water (which we mostly did, except the few times I accidentally splashed myself and others nearby with my paddle). Since it was late January, the river was mystical. The naked, barren trees reached toward a gray sky and looked almost bleak. Yet it was obvious that life shined here – not so much from our colorful boats as we flowed through the water – but in the gloriously green sea grass beneath our boats, and the grasses and plants that shone bright, juxtaposed against the gray along the shore. In many spots, the river bottom was close – close enough to marvel at the different colors of the clear water and to softly brush the sea grass with your paddle. We spent much of the trip at the front of the pack, to prevent playing bumper boats with our classmates, but also to enjoy the river in silence. The splash of our paddles as we steered around branches and over fallen trees was like a lullaby. I didn’t feel compelled to sing “Just Around the Riverbend,” but something magnetic encouraged me to continue propelling forward. Maybe it was the first manatee we encountered and the hope to see more, or the blue heron we watched dive close to the water’s surface. But I think it was my reverence of the river itself that allowed a lifetime of anxiety to ease, now replaced by awe. What the first peoples who discovered the rivers and springs of Florida must have thought when they first caught sight of them – what a beautiful life-giving resource they had found, what a blessing. Water has the power to tear down homes and carve its way through limestone and land, ever flowing. Yet, water is what gives us life – isn’t that why some indigenous people dance for rain or why the ancient Egyptians based their religion around the Nile’s floods? I experienced something beautiful that day. I paddled the Ichetucknee with wonderful new friends and supporters by my side. For many of them, our short trip was one of dozens they have taken in their lives. But for me, the trip ended with a terrific sense of accomplishment and awe. I don’t know when I’ll kayak again, but I’m sure I will. For now, I am grateful for the experience — and for the river, for letting me be a part of it. One of my favorite parts of teaching Environmental Journalism and Nature and Adventure Journalism at the University of Florida is the blend of students drawn to these courses — an equal mix of science and journalism students, and graduate students and undergrads. The semester begins with the science and journalism students at arm’s length, but they grow closer as they discover what they have in common — namely, a search for truth. The science students push themselves to write accessibly to draw the public to their work, while the journalism students learn the importance of solid science reporting to credibility. With her final piece for fall 2015 Environmental Journalism class published in The Tampa Bay Times, UF biologist Anmari Alvarez Aleman, a PhD student in the School of Natural Resources and Environment, reveals the power of a scientist able to write with heart about her research subject, manatees. From TedTalks to invitations to present our work at libraries or even churches, public speaking — and the art of speechwriting behind it — are increasingly crucial skills for environmental journalists and communicators. UF graduate student Jennifer Adler presents her talk, “Illusions: A Lens into Our Fragile Freshwater,” at TEDxJacksonville. 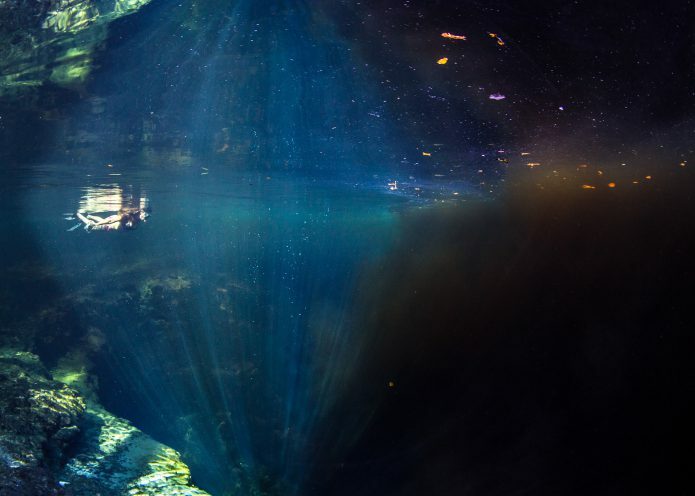 Adler’s deeply personal story of her relationship with water, blended with science and otherworldly underwater photographs, all help make this a compelling talk that will be shared online long after the live event, which took place in November 2015. Every journalist knows a face-to-face conversation is always better than a telephone interview, that taking the time to see, touch and experience what we’re reporting nets a far better story than mining details on the internet. That truth is part of the reason for our field trip in UF’s Environmental Journalism courses. 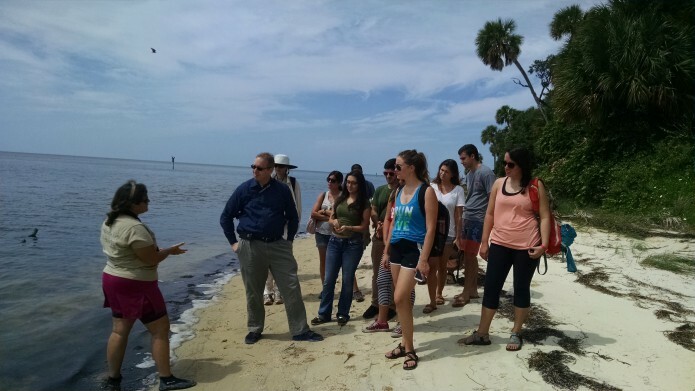 This semester, we headed to UF’s Seahorse Key Marine Laboratory to experience the mangrove-lined Gulf coast island and hear about the national news that took place there in spring. One of the largest bird rookeries on the Gulf coast, Seahorse is a nesting ground for thousands of snowy egrets, pelicans, roseate spoonbills and other shorebirds. In May, the birds suddenly abandoned their nests, a story that drew fairly dire coverage in the New York Times, NPR, and many other outlets. After climbing to the top of Seahorse’s historic lighthouse and hiking along the island’s wild shoreline, students talked with Maria Sgambati, the lab’s education and outreach coordinator, and Kenny McCain, the facilities manager and boat captain. Capt. Kenny has a ZZ-Top beard and a depth of local knowledge and history that comes from being born and raised in Cedar Key and working for a quarter-century as a federal wildlife officer along the islands that make up the Cedar Keys National Wildlife Refuge. Sgambati thought Tessa Stuart of Audubon magazine did the best job ferreting out different theories for the nest abandonment, which include those as mundane as raccoons or aircraft noise. Researchers may never know for sure what caused the colony to fly away. The most important questions will be answered next spring: Will the birds return to Seahorse Key? Will they return to Snake? Also significant: What will happen to Seahorse’s cottonmouth snakes, which famously depend on fish falling from the birds’ nests for their survival? UF, state and federal scientists have lined up studies of those questions and others. Meanwhile Capt. Kenny has his money on the raccoons. His stories of wrangling with the masked bandits over his lifetime on these islands had the students laughing over their lunches, and gleaning valuable lessons on the importance of indigenous knowledge – along with those on nuanced writing, and of course, reporting in person, especially when it means spending the day on an undeveloped island in the Gulf of Mexico. The National Hurricane Center’s 5-Day forecast for Tropical Storm Erika draws a bead on Lake Okeechobee, the 730-square mile icon of so much of what’s gone wrong with water in Florida. A 1928 hurricane that hit there sent the lake bursting through and over its earthen dike, killing 2,500 people, most of them poor black laborers who drowned in the agricultural fields south of the lake. 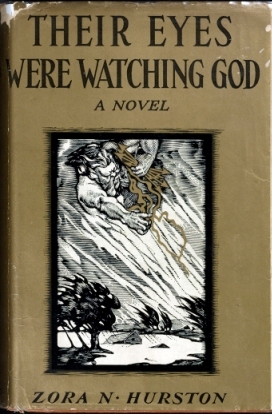 Zora Neale Hurston captured the calamity in her novel Their Eyes Were Watching God. In the wake of the storm, the Army Corps of Engineers began to build a massive levee around Lake O.’s south rim. After the 1947 wet season dumped 108 inches of rain in South Florida, Congress authorized the Central and Southern Florida project to try and tame the capricious climate once and for all. The engineers ultimately built 1,000 miles of canals, 720 miles of levees, sixteen pump stations, two hundred gates and countless other tack. The harm to Florida’s great Everglades, its water and wildlife became clear before the project was even finished. In next week’s Environmental Journalism class — the Monday Erika could make a Florida landfall — students will hear from Florida Sea Grant Executive Director Karl Havens on Everglades restoration and its viability amid climate warming and politics boiling. But what about the immediate safety of those who live south of the lake? Student readings for Monday include the Miami Herald’s Curtis Morgan’s award-winning story “On the brink of disaster” that shows the levee ringing Lake O. today is another disaster waiting to happen. Fortunately, the current lake level is lower than in the past few years — about twelve feet, six inches, says the Army Corps’ John Campbell. The lower the level the safer; the higher, the greater the pressure and chance of a breach. There’s about a 5 percent chance of a breach at 16-foot water levels and 45 percent chance at 18 feet. Failure is expected at 20 feet. In 2012, Hurricane Isaac dumped enough rain as it traveled over Florida to raise Lake O. from about where it is today to sixteen feet, Campbell says. The Corps tries to keep the lake between 12.5 and 15.5 feet in a delicate and controversial balance of water releases that can foul estuaries and fuel harmful algae blooms along Florida’s southeast and southwest coasts. Since 2007, the agency has spent $500 million on its project to bolster the dike, including new concrete barriers that offer “some improvement in the risk picture,” says Campbell. Yet the project, separate from Everglades restoration, will not be finished until 2020. Congratulations to CJC alumnus Bruce Ritchie, who will join Politico this fall covering energy and environmental issues from Tallahassee. Bruce earned his MMC from UF in 1993 (his thesis, as committee member Kim Walsh-Childers will remember, tracked industry pressure on environmental journalists). In the two decades since, Bruce has built a reputation as one of the most respected environmental reporters in Florida. 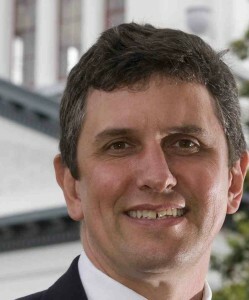 He’s also been one of the best at surviving tumult in the newspaper industry, founding the environmental news site Floridaenvironments.com and writing for the Florida Current following the Tallahassee Democrat’s elimination of the beat in 2008. Bruce has written extensively about energy, growth, pollution threats to Florida’s groundwater and springs, and the fight over water among Florida, Georgia, and Alabama – the subject of his first book, in the works for University Press of Florida. Students taking CJC’s Environmental Journalism class in fall 2015 will get to meet Bruce in November when he guest lectures. Follow him on Twitter @bruceritchie. With ecosystems and societies around the world anticipating—or already facing—the consequences of climate change, the US Southeast may find an unlikely hero in a disappearing native tree: the longleaf pine. These towering pine species once dominated the region as far north as Virginia and as far west as Texas. Now, only 3% of its historic range remains. Centuries of human development, timber production, and disturbance of their fire regime have drastically impacted the longleaf pine. But despite their past rapid decline, climate scientists and ecologists expect longleafs will emerge as some of the strongest survivors of a warming world – and some of the best-able to help communities cope with the effects of climate change. Longleaf pines are better adapted to handle more extreme precipitation patterns, severe storms, pest infestations, and fire than other southeastern species, according to a 2009 report from the National Wildlife Foundation. One of the most remarkable features of longleaf pines is their habitat diversity. If you were to tell someone “Take me to see a longleaf pine,” you might find yourself in any multitude of different landscapes. Longleafs grow in widely varying environments—from Alabama mountainsides to wet flatwoods to dry sandhills. Already adapted to a wide range of landscapes, longleaf pines are expected to hold up better against a future of prolonged and intensified droughts and floods. Longleafs also have a considerable track record for surviving severe storms and hurricanes. After Katrina devastated the Gulf in 2005, researchers in Mississippi evaluated the damage, finding mostly healthy longleaf among the carnage of two other pines native to the slash and loblolly pines. Compared with robust longleaf, skinny but fast-growing slash and loblolly pines suffered. The researchers found that 64% of longleaf were unaffected while only 52% of slash and 16% of loblolly survived unscathed. Longleaf not only had less affected trees, but also less intense damage. Slash and loblollies often snapped mid-stem. The longleaf damage was little more than leaning. In terms of timber production, a snapped stem means a major loss in value. Climate change is also expected to exacerbate damage from pests, particularly the southern pine beetle, which has already cost the United States hundreds of millions of dollars in economic . With warmer temperatures and changing precipitation patterns, the beetle’s range will most likely expand. Longleaf pines are significantly less susceptible to infestation than other species. Planting the more resilient species could lessen the extreme losses. 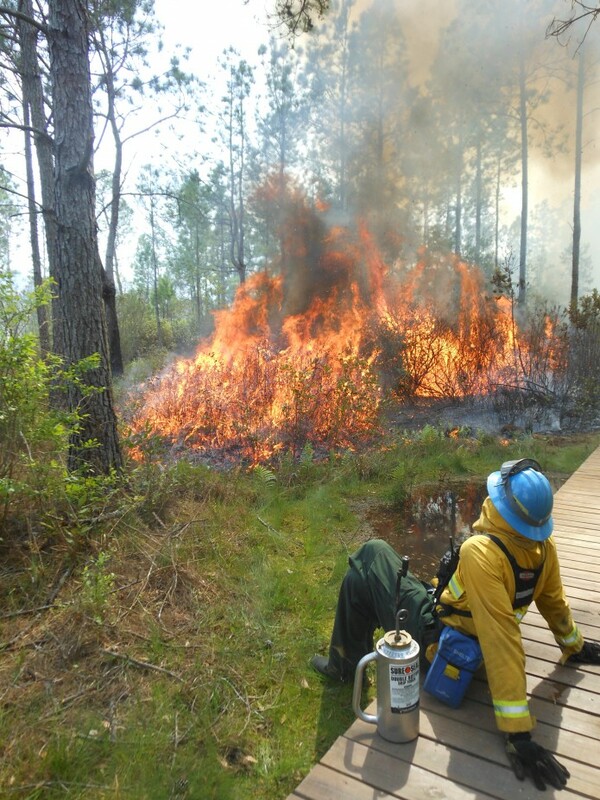 This winter, the Florida Forest Service (FFS) broke a record. Over two days in January, a team of 60 foresters managed the largest controlled burn ever carried out at Goethe State Park — 12,345 acres. The massive park covers 53,587 acres itself and contains the largest contiguous tract of longleaf pine in Florida. Prescribed burning is a management tool used to maintain forest health, promote biodiversity and reduce the risk of dangerous wildfires. Without fire, woody plants like laurel oaks move in and compete with the herbaceous plants like grasses native to these fire adapted ecosystems. “Frequent fire in effect mows down broadleaf woody plants,” says Kevin Robertson, fire ecology scientist at Tall Research Station. This allows more sunlight into the canopy and brings about a more diverse ecosystem. Even considering these benefits, setting thousands of acres of forest on fire hardly seems like a sensible way to combat carbon emissions. Burning releases carbon stored in trees and other organic matter found in forests. But, counter-intuitive as it sounds, prescribed burning reduces emissions in the long run. When forests go unburned for a long time, fuel accumulates. These conditions lead to higher-intensity, more-dangerous forest fires. Regular burning reduces the build-up of flammable materials and results in less-severe fires. These milder fires creep through the understory, leaving some vegetation intact. High intensity wildfires scorch the landscape, often killing even the most fire-adapted species. Prescribed burning reduces the risk of these dangerous and destructive wildfires that spew out significantly more climate-warming carbon. A study from Northern Arizona University found that prescribed burning reduces carbon emissions 18 percent to 25 percent on average – and sometimes as much as 60 percent. The longleafs themselves also store more carbon, far longer than their scrawnier counterparts. Through photosynthesis, plants take up carbon dioxide from the atmosphere and store it in until they die. Longleafs outlive both slash and loblolly pines. Archaic stands of old-growth longleaf can have pines as old as 450 years, twice the lifespan of their young brothers. For the first 120 years, the trees take in and store more carbon than they release from natural mortality. After they die, longleafs also release carbon at a slower rate due to the higher quality of their wood. Planting more longleaf pines would tie up more carbon, reducing greenhouse gases in the atmosphere. As the longleaf’s advantages have emerged, scientists and policymakers have launched significant efforts to protect and expand their forests. The Obama Administration’s America’s Great Outdoors initiative of 2010 created the Longleaf Stewardship Fund, bringing together funding from private and public groups to protect longleaf pines. New carbon policies may serve as a welcome ally to restoration efforts as well. Assembly Bill 32, the California Global Warming Solutions Act of 2006, was passed with the intention of reducing California’s greenhouse gas emissions to 1990 levels. One aspect of AB 32 allows companies to offset their emissions by investing in projects that reduce carbon in the atmosphere, including investing in southeastern pine plantations. That could mean more longleafs. AB 32 requires forest and plantation used to offset carbon emissions to be diverse. Specifically, they can’t be comprised of more than 70% of a single species. Since either slash or loblolly pines generally dominate plantations, companies will have to include other species in their stands. “We’re hoping the other 30% will be longleaf,” says Robert Abernethy, president of the Alabama-based Longleaf Alliance. While longleaf pines have immense potential to adapt to climate change, research continues to investigate the long-term fate of these southeastern icons. With conditions changing rapidly on a geologic time scale, species must either adapt to their new environments or migrate as their distribution range shifts—the more likely option. Unfortunately for trees, they can’t pick up and move all that easily. Foresters with the Nature Conservancy have started experimenting with the “assisted migration” of longleafs. This means introducing the pines to potentially favorable regions. The researchers planted twenty acres of pine seedlings in Maryland, just north of their natural range. One year later, they conducted a prescribed burn, maintaining a healthy environment for the young seedlings. While the team dubbed the burn a success, conclusions on the future home of longleafs and the viability of assisted migration will take time. Conserving and restoring longleaf isn’t only sensible as a climate change adaptation strategy, but also from economic and ecological perspectives. The prolonged dormant grass stage of longleafs and difficulties with regeneration have lead timber producers to typically favor raising slash pine in the south and loblolly pine in the north. However, improvements in longleaf planting and growing techniques have made them a viable contender for the industry. For example, planting seedlings initially sowed in containers over bare-root seedlings has increased the success of establishment and can even reduce the time to initial growth. Longleaf stands also produce higher quality timber. The straight, durable trunks of longleaf can more often sell as pole timber, a highly valued wood product. Resilience to pest infestation and damage from storms also reduce risk of economic loss. Investing in longleaf ecosystems would also bring relief to a rich community of animals and plants. Many threatened and endangered species rely on longleaf pine habitat such as the red cockaded woodpecker, the gopher tortoise, and the flatwoods salamander. While climate change will undoubtedly stress ecosystems—including longleaf—the resilient pine is the contender to watch in a world that will be forced to adapt. Congratulations to brand-new CJC alumna Alex Harris, whose investigation into unsustainable landscape practices in Florida homeowners associations has been published in the Tampa Bay Times. For her long-form story in spring Environmental Journalism class, Alex tracked down residents around the state who’ve tried to replace thirsty St. Augustine grass with Florida-friendly landscaping, only to be sued by their homeowners associations. The Florida Legislature changed state law fifteen years ago to ensure this could no longer happen, but Alex found the problem persists, with residents on the hook for tens of thousands of dollars in legal fees. Great job, Alex! We hope your story will help clarify the law and protect conscientious Floridians and our water resources. Applications have opened for CJC’s latest specialized reporting institute, “Covering Water in a Changing World,” Nov. 12-13th in Gainesville. The workshop is designed for journalists and broadcasters in small and medium-sized markets who are covering emerging water and climate stories in the Eastern U.S., but any journalist grappling with these issues is welcome to apply. Thanks to a grant from the Robert L. McCormick Foundation, we’re able to cover all expenses for thirty reporters to attend. Please visit http://www.jou.ufl.edu/water for more information about our program, and the application. Feel free to call or email Cynthia Barnett with any additional questions, 352-376-4440 or clbarnett@jou.ufl.edu. State of Water, State of Change showcases the work of students enrolled in Environmental Journalism courses at UF's College of Journalism and Communications. We are happy to share work under this Creative Commons attribution license. Please attribute the writer and CJC. Email Cynthia Barnett @ clbarnett@jou.ufl.edu with questions and republished links.